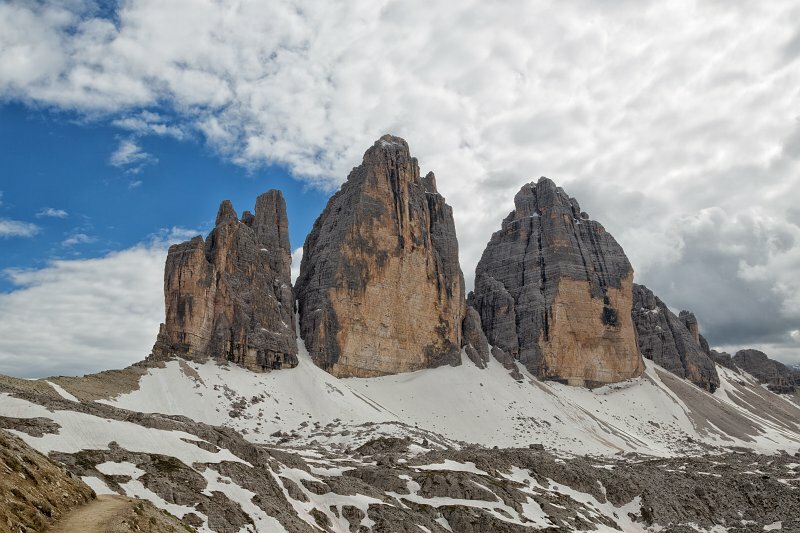 The Tre Cime di Lavaredo (Italian for "the three peaks of Lavaredo"), also called the Drei Zinnen (German, literally "three merlons"), are three distinctive battlement-like peaks, in the Sexten Dolomites of northeastern Italy. They are probably one of the best-known mountain groups in the Alps. The three peaks, from east to west, are: Cima Piccola/Kleine Zinne ("little peak") - 2,857 meters (9,373 ft), Cima Grande/Große Zinne ("big peak") - 2,999 meters (9,839 ft), Cima Ovest/Westliche Zinne ("western peak") - 2,973 meters (9,754 ft).